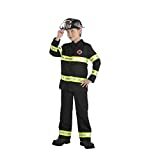 The little fireman will help you find fun and laughter and the little Kitty trapped on a tree with this small firefighter costume for kids. Complete with a jacket, a hat, and pants. This costume will go hot, hot, hot on your tiny hero.. this handsome outfit is great for aspiring actors, to use on dress up events, and Halloween.